This cake sings of summer. It has a squidgy crumb, followed by a ripe sweetness from the fruit. The coconut yogurt makes an ideal foil, though you could use crème fraîche instead. 1. Preheat the oven to 170˚C, gas mark 5. Grease and line the base of a 20cm springform cake tin. Blitz the pistachios in the small bowl of a food processor until they have the consistency of ground almonds, then tip into a bowl. 2. In the large bowl of a food processor, cream the butter, Greek yogurt and sugar together until light and fluffy. Don’t worry if it looks a bit grainy. Whizz in the pistachios, polenta, baking powder, salt and lemon zest and juice until combined. Crack in the eggs one by one, mixing after each one. 3. 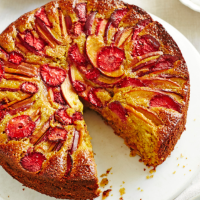 Tip the batter into the cake tin, top with the fruit and bake for 1 hour 10-15 minutes, until a skewer inserted into the centre comes out clean. Leave to cool in the tin for 10 minutes before transferring to a wire rack. 4. When you are ready to serve, whip the coconut milk (or Greek) yogurt and vanilla seeds together. Serve with just-warm slices of cake. This recipe was first published in Mon Jun 01 15:13:36 BST 2015.